Montessori is more than an approach to education. It’s a way of seeing the world that fosters life-long accomplishments. As a caring Montessori parent, you can foster your child’s social, emotional, and intellectual development by choosing your words to reflect the Montessori philosophy. If you’re wondering how to do so, we have some tips! As Montessori teachers, we carefully choose our words to convey consistent expectations to each child in our preschool and primary school classrooms. We model respect, kindness, and positivity to help students master the social skills vital to future success. We use words that encourage children to be independent, intrinsically motivated critical thinkers. 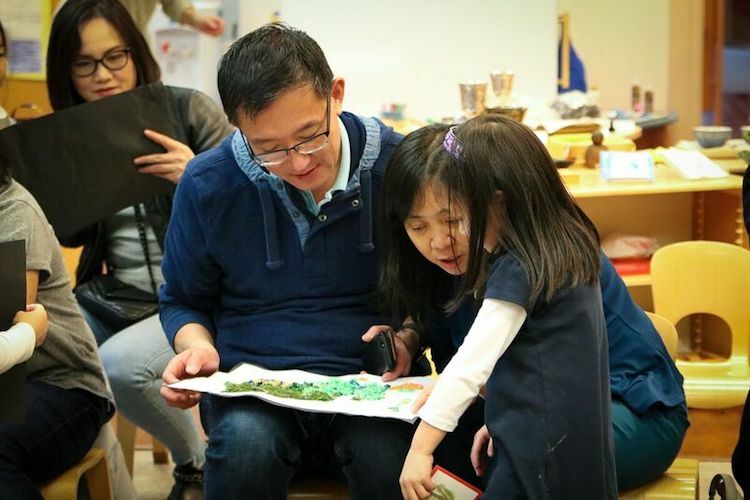 Here are 6 phrases we use in our Montessori preschool and primary school classrooms that you can use to foster your child’s learning and growth at home. Montessori values the process over the final product. Research shows that children who are praised for their efforts rather than their abilities develop strong self-esteem, confidence, and persistence—all keys to long-term success. The Montessori approach encourages self-directed learning. Our teachers act as guides, offering assistance as your child explores the carefully designed classroom materials and discovers new concepts. This approach promotes your child’s intrinsic curiosity and desire to learn. At home, encourage your child to evaluate his or her work rather than seeking approval for it. Instead of telling your child whether you like what they’ve done, inquire about the process. Ask how it felt to do the work, why they used certain colors or shapes, and what their favorite part is. Montessori fosters your child’s ability to be independent and capable of self-care. We help children develop the skills to think for themselves. While it’s tempting to give a child a quick answer, it’s often better to answer a question with another question. Help your son or daughter walk themselves through the process of thinking things through. For example, if your child is missing his mittens, ask questions: “Where did you last have them? Where do you usually put them? Did you check your room?” This process takes time, but it teaches your child how to solve problems. In our classrooms, our teachers encourage students to care for their environment—decorating the room, watering plants, cleaning tables, straightening up the space, and other activities they can easily master at their age. When a job is too big for children to handle on their own, it’s important to resist saving the day by fixing everything. But it’s also important to not leave a child overwhelmed and helpless. We achieve a balance that preserves their independence and confidence by asking how they would like us to help them. When we need to remind children of a classroom rule, we avoid giving commands or offering judgments. Instead, we phrase the rules as reminders to invite children to cooperate and take initiative for choosing positive behaviors. This approach also helps to prevent power struggles between the teacher and child. This phrase isn’t something we say to your child—but we often say it to each other as Montessori teachers, as well as to you as a parent. “Follow the child” is a reminder to have faith in the child, believing in their ability to learn and grow according to their own internal developmental timeline. It’s also a reminder that every child is unique. Your son or daughter has individual needs, gifts, and passions that we should encourage him or her to pursue. As a parent, you can help your child develop by paying attention to what he or she enjoys doing and then offering it as a way to draw them into other areas of learning. For example, if your daughter loves being silly, you might use joke books to encourage her to read. If your son enjoys cooking, you might make recipes together and use the measurements to teach him counting, adding, and subtracting. Montessori is a powerful way to connect with your child and bring his or her gifts and passions to the forefront, equipping them for lifelong success. See for yourself the difference that a Montessori education can have for your child’s growth and development. We’d love to have you visit our preschool and primary school classrooms! Contact us to schedule a tour and see our programs for students ages 2 through 9. Plus, check out our before and after school hours that make it easy for busy parents to give the best care to their children beyond the school day.